The Environmental Protection agency told officials in 31 states Thursday they must develop new pollution controls because the air in some of their counties, home to more than 150 million people, does not meet air quality standards. The EPA said that all or part of 474 counties, mostly in the eastern third of the country and in California, do not meet the federal health standard for smog-causing ozone. Officials have three years to develop plans to come into compliance. The new standards "are strong medicine" and "will require more actions on your part to achieve cleaner, healthier air," EPA Administrator Mike Leavitt said he told governors of the states. The EPA said that the regions in noncompliance may have to impose new controls on industrial plants, restrict transportation and require tougher vehicle inspection programs to clean up their air. Some counties also may have to require the use of special, cleaner-burning gasoline. The EPA already has said it will take actions to reduce pollution from power plants and announced Thursday, in a companion regulation, new requirements aimed at curtailing air pollution over state parks. "This isn't about the air getting dirtier. The air is getting cleaner," said Levitt. "These new rules are about our new understanding of health threats, about our standards getting tougher and our national resolve to meet them." The county designation has been long awaited, ever since the EPA in 1997 issued tougher health standards for ground-level ozone and fine soot because of concern that the requirements were not adequately protecting the elderly, children and people with respiratory illnesses. Deadlines for meeting the air quality standards range from 2007 for those with the least serious problem to as long as 2021 for areas with the dirtiest air. 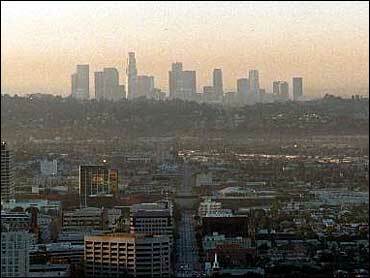 The EPA said the Los Angeles basin had the worst smog problem, the only region to be placed in "severe" pollution category. Three other regions of California — Riverside County, San Joaquin Valley, Sacramento — were designated as having "serious" pollution and have until 2013 to meet the standards. The counties in nonattainment included most of California, a ring of states around the Great Lakes, and a concentration of states in Northeast from Washington, D.C., to Boston as well as eastern Tennessee, Georgia, North Carolina and the Dallas and Houston areas in Texas. Leavitt said despite the widespread notifications of noncompliance "many states received good news." He said 2,668 counties met the standards, as did 19 states: Alaska, Florida, Hawaii, Idaho, Iowa, Kansas, Minnesota, Mississippi, Montana, Nebraska, New Mexico, North Dakota, Oklahoma, Oregon, South Dakota, Utah, Vermont, Washington and Wyoming.